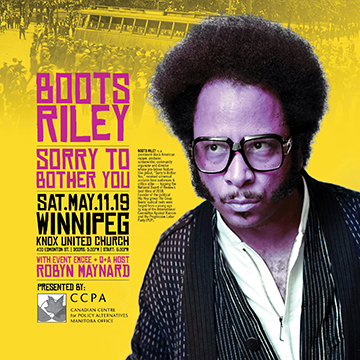 Winnipeg — Canadian Centre for Policy Alternatives–Manitoba (CCPA MB) is pleased to announce the Winnipeg appearance of artist, activist and filmmaker Boots Riley Saturday, May 11th, 2019 —commensurate with several local 100th anniversary commemorations of the 1919 Winnipeg General Strike. Riley’s Knox United Church address will concentrate on the intersectionality of class, race and resistance in an austerity-driven 21st century capitalist economy. Founder of the political Hip-Hop group The Coup, Boots Riley is a musician, rapper, writer and activist whose feature film directorial and screenwriting debut — 2018’s celebrated Sorry to Bother You — was heralded as “one of the best anti-capitalist films in recent memory” by Jacobin magazine. Boots’ activism, which invariably espouses a pro-labour position, remains front-and-centre in all his work. Previously considered a frontrunner for Best Original Screenplay at the 2019 Academy Awards, Riley himself was nominated this year by the Director’s Guild of America for Outstanding Directorial Achievement (First-Time Feature Film), while Sorry to Bother You alongside received two 2019 Critics Choice Award nominations for Best Actor (Comedy) and Best Film (Comedy). May 2019 marks the 100th anniversary of the 1919 Winnipeg General Strike, in which 30,000 Winnipeggers rose to demand: the right to collectively bargain; the establishment of a living wage; and the protection of workers’ rights, altogether, which Riley’s talk will in part celebrate. Indeed, Riley is one of the leading artists of our time whose work and activism meaningfully reflects and advances collective labour struggles and resistance to worker exploitation. The event will include a Q and A with Canadian black feminist writer Robyn Maynard. Activist, educator and author, Maynard’s most recent book is entitled, Policing Black Lives: State Violence in Canada from Slavery to the Present. A portion of evening proceeds from May 11th’s event will be shared with Fight for $15 and Fairness Manitoba: a local group working to advance the rights of minimum wage and precarious workers. Thank you to our event sponsors Assiniboine Credit Union, Canadian Federation of Students Manitoba, Fernwood Publishing, Kendrick Quality Printing, Manitoba Building Trades, University of Manitoba Department of Labour Studies, Manitoba Teachers Society, The Winnipeg Foundation, and the United Food and Commercial Workers Union Local 832.